As a solo artist, Jessi Colter remains best known for her delicate and heartbreaking 1975 single “I’m Not Lisa.” But her life and career have been most deeply defined by her personal and artistic partnership with her late husband, the legendary country outlaw Waylon Jennings. At home, on the road, and on stage, the two were bonded in marriage and music from their nuptials in 1969 to Jennings’ death in 2002. Colter’s last album, 2006′s Out of the Ashes, endures as a moving journey of remembrance and renewal in the wake of her mate’s passing. 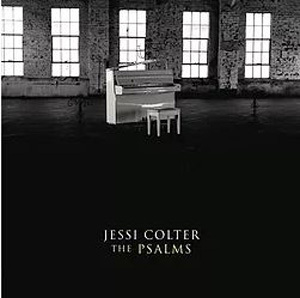 But even those very familiar with Colter’s myriad talents and track record will likely find themselves caught off guard with artful and revelatory “The Psalms,” an album of improvised sacred music produced by Lenny Kaye. The project traces back to accidental beginnings. In 1995, Kaye was staying at the Jennings-Colter home while working with Jennings on his autobiography. Early one morning, Kaye happened upon Colter at the piano. He was stunned at what he heard. She was improvising ecstatic music and singing religious verses from the Old Testament attributed to King David. Kaye finally brought Colter to New York in 2007 and recorded songs in two sessions in a Manhattan studio. The original tracks feature Colter on vocals and piano, and Kaye on electric and acoustic guitar. He later augmented the arrangements with a variety of subtle instrumentation (tympani, harp, mandolin, violin, mellotron) courtesy of numerous contributors—including producer and Bob Dylan collaborator Al Kooper as well as a cappella trio Black Sea Hotel. Given his penchant for working with Patti Smith, with whom he first made his name as a guitarist, it’s little wonder Kaye took to Colter’s soulful improvisations. And he seems the perfect producer to shepherd the spiritually resonant tracks to fruition. The Psalms is shockingly beautiful. “Psalm 150 Praise Ye the Lord” feels trance-like and incantatory. Colter intones over rippling cymbals and warm piano notes, her voice doubling as a ghostly cry of faith. “Praise God in sanctuary…praise him with the sound of a trumpet,” she sings. On “Psalm 75 Unto Thee,” Kaye surrounds Colter with a blend of jazzy guitar notes, Hammond organ strains, and restrained percussion. Many arrangements benefit from subtle layering techniques. Some are quiet as a whisper, while others emerge as spirited as a shout. Colter’s delivery remains the backbone. Much like Patti Smith’s vocal timing, her phrasing is instinctual. Untethered from the traditional arrangements of her usual work, she enjoys freedom to experiment in new ways. You don’t have to be among the faithful to be taken with “Psalm 114 and the Mountains Skip Like Rams,” a song that vibrates with mournful strings and somber piano chords. Colter’s words, pulled from ancient texts, echo with arresting imagery. Her insistent voice trembles while she sings of hard rock turned into springs of water. Indeed, these songs frequently feel like miracles unto themselves. It’s enough to turn a doubter into a true believer.